You’ll love these bacon wrapped jalapeño peppers stuffed with cream cheese and shredded cheddar. 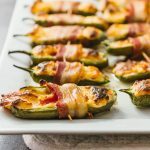 Similar to jalapeño poppers except that these are low-carb and baked in the oven. Add cream cheese to a microwave-safe mixing bowl. Microwave until slightly softened, about 15 seconds. Add cheddar cheese and garlic powder. Mix until combined. Stuff each pepper half with the cream cheese mixture. Wrap a halved bacon slice around each pepper. Secure with a toothpick as needed. Place the stuffed peppers in a single layer onto a baking tray. Bake at 400 F until the cheese is starting to brown, about 20 minutes. Turn on the broiler and broil for a few minutes to crisp up the bacon. Remove from the oven and let cool for 10 minutes before serving. This recipe yields 1 g net carbs per serving (1 bacon wrapped jalapeño half).